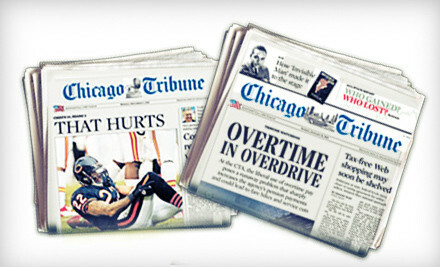 Groupon: Chicago Tribune 2 yr Sunday Delivery for $20 or $.19 a paper!! Today on Groupon, you can purchase $20 for Two-Year Sunday-Only Home-Delivery Subscription from the Chicago Tribune (Up to $207 Value) If you use coupons at all you know this is an amazing deal. I just picked up an extra subscription for my house. That’s 104 sunday papers for $20 or $.19 a paper. You truly can’t get one that cheap anywhere. So hurry and pick one up.